In September when I released my last big shop update, I still had tons of things I planned to make. So far I’ve been staring at a partially started Triforce throw and a list of unfulfilled ideas. Thankfully this isn’t entirely disappointing, I’ve been busy earning a living. Which is much better than procrastinating or being plain lazy. So far the only way I’ve been able to expand my shop has been through special requests from buyers. Thank goodness for you guys, you keep me interested. 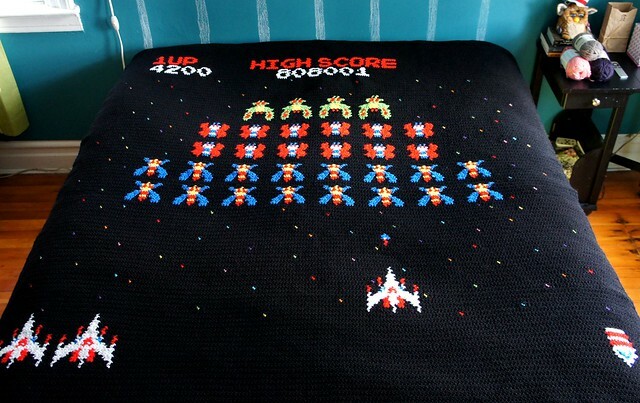 That’s how this new Galaga blanket came about. Making Galaga fills me with happy, I really love the rainbow of colors involved. I’ve recently gotten a couple of fun requests that I can’t wait to knock out. Some are going to be a major challenge, but that’s what makes it fun. One of my new projects isn’t even arcade themed, crazy… I know. Still nerdy though. Never forget your roots. Read on to welcome Galaga to the family. Does it make me sound cocky if I say how much I love my new throw? Whatever, I LOVE my new throw! I have a list of all the blankets and throws I want to eventually make. 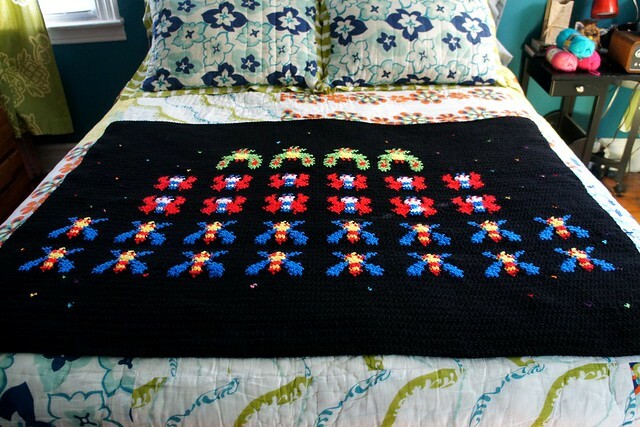 Since I already have Space Invaders, Galaga was low on my list of next projects. However, someone requested that I make it… which instantly makes it a priority on the list. Before I upset any gamers with my comparison of Space Invaders to Galaga let me just say, I only mean style wise, I already make something with rows of intergalactic enemies. Don’t yell at me, I’m sensitive. Either way, I really like Galaga because of how colorful it is. It has a lot of pop. I’m also glad I decided to add the specks of stars. I’m super excited for when I have the time to make a full level blanket, as much as I love my little throws, I really love making full length level blankets. They make me nostalgic for hanging out at the arcade with my friends. 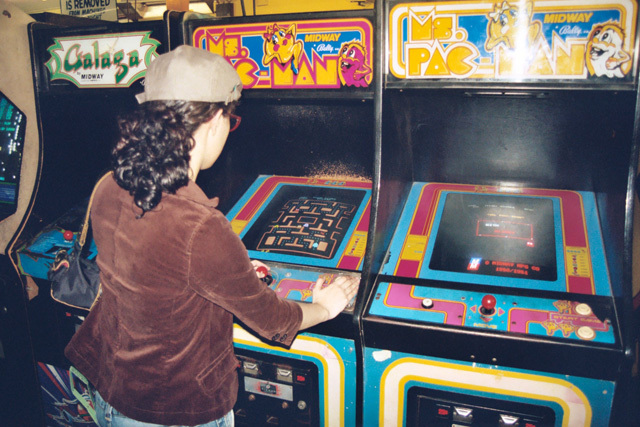 I was a big Ms. Pac-Man junkie and I remember Galaga was right next to Ms. Pac-Man at our local arcade. My friend was a huge Galaga fan so even though we ran to separate machines we were at least close enough to hang out and be engrossed by our chosen arcade machine. 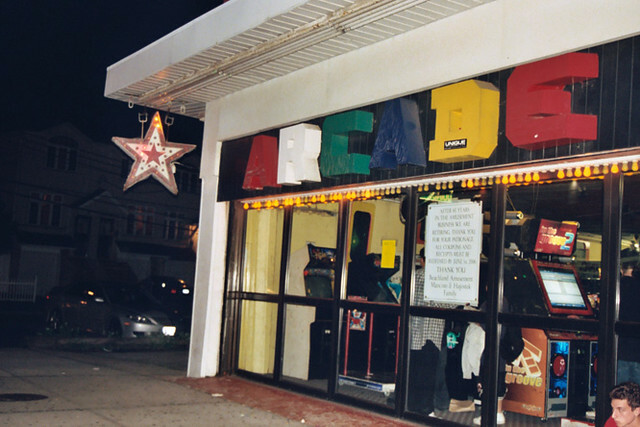 Now I’m making myself sad that that arcade went out of business in 2006. The above photo was taken the last weekend it was open. I went to the auction of all the games, we wanted to bid on skee-ball — that would have been awesome. Terrence won me the tiny color tv prize that I had always saved up my tickets to get. Tears. Guys if you still have one, support your local arcade.